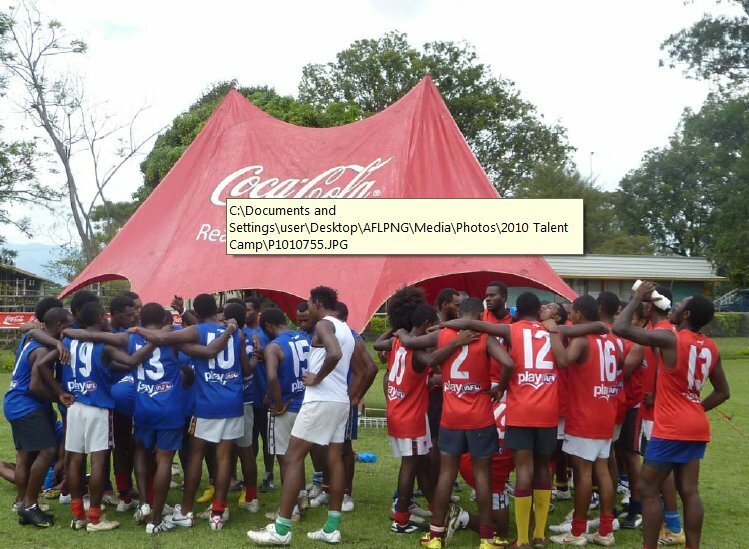 The 2010 Coca-Cola AFLPNG Talent Camp was held over the weekend at the National Sports Institute in Goroka, Papua New Guinea. 85 kids from all over PNG, including the New Guinea Islands, the Highlands, Lae and Port Moresby gathered in the Eastern Highlands province for a weekend of gruelling physical testing. Attended by AFL Queensland Officials, Andrew Cadzow, David Lake and Bill Renner, the weekend kicked off with a 3km time trial. Laurie Logo from Port Moresby clocked the best time of 11:15. Logo was thrilled when asked about his run. “It was a good time, and I’m happy with the run. I have been training and working hard in Port Moresby and I think it has paid off for me here at the Talent Camp”. The boys were then divided into age groups, Under 13, Under 15 and Under 17 and were put through a variety of demanding tasks including an Agility Run, 20 metre sprints, vertical jump and a practice game. The boys produced some fantastic numbers which impressed the staff from Australia, including AFL recruitment officer, Matthew Clarke, from the Richmond Football Club. Matthew was invited to PNG to witness the rapid development of the standard of football, whilst also to keep an eye out for any extreme talent that could follow the talent pathway program to Australia. The final physical tests conducted on the boys were clean hands, handballing and kicking drills. The drills are the same used in AFL Talent Camp testing in Australia. These tests are quite hard and are marked on efficiency and accuracy. AFL Asia/Pacific Manager Andrew Cadzow says it’s important to replicate the testing done in Australia so as to gauge a clear indication of the status of these kids. Throughout the 3 day Talent Camp, the kids were also lectured on life skills, healthy eating and healthy lifestyles. Coach of AFL Queensland team Mt. Gravatt, David Lake, gave the kids a clear message throughout the weekend. “Only you as individuals can work hard to achieve the goals you have set. Don’t rely on others to reach the level you want to reach. Work hard, make sacrifices, and you will achieve your goals. Make no excuses”. The Coca-Cola Talent Camp has sent a few boys down to Australia over recent years, including Donald Barry, David Meli and Peter Labi who is now training at Carlton. AFLPNG manager Walter Yangomina was happy with how the weekend unfolded, and was amazed at the talent on display. “These kids are within The Coca-Cola Talent pathway, and they are taking advantage of the opportunities we are giving them. From here, kids from all age groups are selected to represent PNG on the international stage or even play football in Australia like Barry, Meli and Labi have done so before them”.